National Theatre launches subtitles glasses. It’s important to note over 100 Deaf people have trialled these glasses at the National Theatre. Performance Interpreting recommended the New York Times contact Deaf people involved in the trial to provide feedback & interviews. 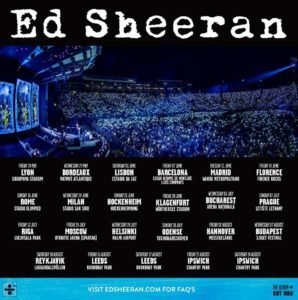 Performance Interpreting are proud to be working with Kilimanjaro Live & DHP Family to provide a BSL Interpreter for two dates on the Ed Sheeran Tour 2019. 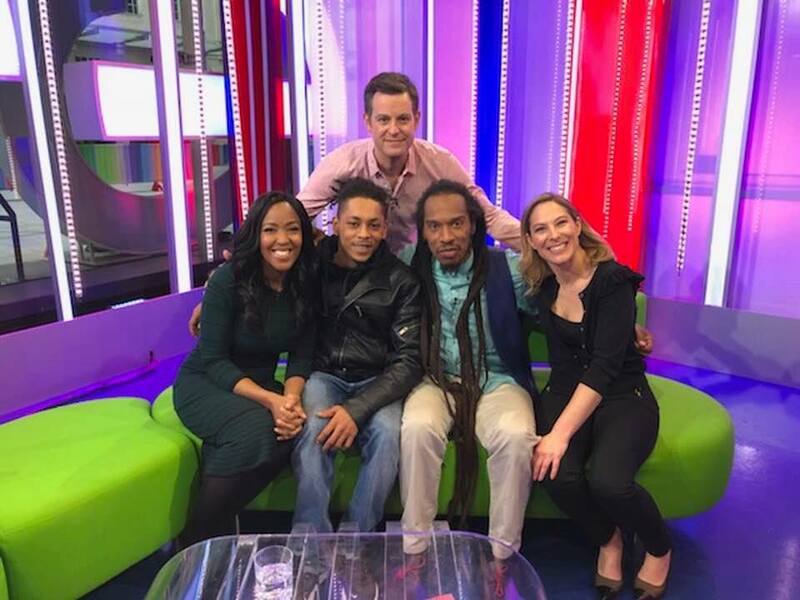 Kilimanjaro Live & DHP Family are one of the first promoters to provide BSL access at the point of ticket sales. BSL Interpreting will be available on request for August 17th 2019 in Leeds and August 24th and 25th 2019 in Ipswich. Tickets can be purchased here: edsheeran.alttickets.com and are on sale from 27th sept. Tickets are reserved for BSL Users, however they are still likely to sell out fast. It is possible more dates may be added depending on demand. Facetime / skype in BSL available. Please email: access@alttickets.com (Please let them know you are Deaf and would like to be near the BSL Interpreter. If you have additional access needs and require seating or wheelchair a accessible area, please let them know so they can make the necessary arrangements). Please email: access@alttickets.com (If you have other access needs please let them know when buying tickets and that you also need to see the BSL Interpreter so they can make the necessary arrangements). Download festival wins an award for accessibility – BSL Interpreting provided by Performance Interpreting. 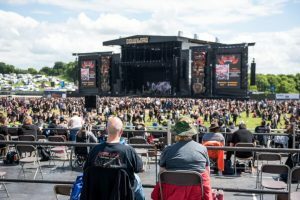 Performance Interpreting are proud to be providing interpreters for the first ever Access Service at this years Download Festival. Deaf Rock fans – get ready! Following Performance Interpreting’s Abigail Gorman in her role as British Sign Language Coordinator at Bestival – she’s determined to make festivals accessible for deaf people, but will it be smooth sailing on the day?. I recall seeing a photo online a while back of Anthony, lead singer in Red Hot Chili Peppers, perform next to an American SignLanguage interpreter. Social media went crazy with people desperate to know who the interpreter was – who actually now receives a fan following in her own right. Sassy, expressive and fully owning the song, she wasn’t just an interpreter, she was a performer. 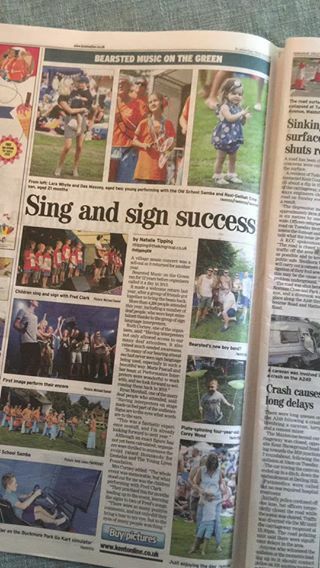 And then here in Blighty last summer, I noticed the buzzing of excitement amongst my deaf festival goer friends as they discovered their favourite artists would be performing with a – gasp! – sign language interpreter beside them. We’ve had interpreters at musicals and theatre productions for a while now but at gigs… And rock concerts…? What’s going on? Well, may I introduce Performance Interpreting who work across the UK delivering high quality, artistic sign language interpreters at various events… specialising – obviously – in performing arts. 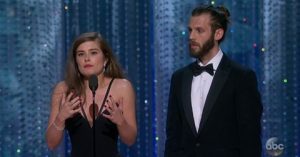 Headed by full time interpreter, Marie Pascall, the company was initially set up after seeing her friend refused Sign language access to a festival she wanted to attend. 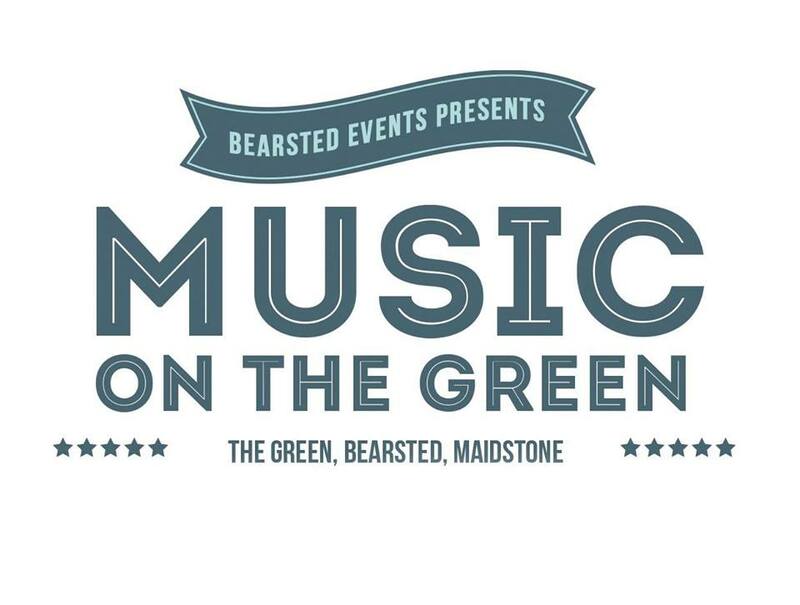 Recognising there was a huge gap in the music industry, Marie set to work encouraging venues and promoters to make their events accessible to the deaf community. The aim of Perofrmance Interpreting is to open as many doors as possible to provide quality access and social inclusion. They also work with Deaf BSL Interpreters and Performers too. 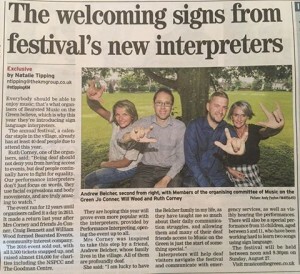 And to ensure the company is led by its clients – so to speak – Performance Interpreting has recently set up a BSL steering group in conjunction with Attitude is Everything to ensure the deaf community are truly represented and have a real impact in accessible services going forward. And it seems all of her hard work is beginning to pay off. I was delighted to discover that the company, which was only formed a mere 18 months ago has landed some very exciting agreements. And I’m thrilled to tell you guys about one of them. 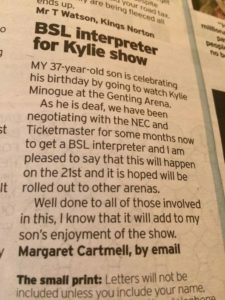 If you ever want to attend a show at Nottingham’s Motorpoint arena, you can request an interpreter on your preferred attending date and they will provide one, courtesy of Performance Interpreting. They also have BSL interpretations as part of their core programme too! See their access page by clicking here. This kind of news is nothing short of groundbreaking. And I must stress that the calibre of interpreters used by Performance Interprters is outstanding. Performance Interpreters actually invited two of Limping Chicken’s biggest rock music fans to attend a signed interpreted Limp Bizkit & Korn concert. And to say that they were impressed by the service is an understatement. These guys, both deaf sign language users, are big on their music but had never attended a sign interpreted show before. I was curious… Would they enjoy it? Here’s what they had to say..
Judging by the amount of preparation the interpreter, Susan Merrick, had to undertake before the show, I’m impressed and relieved that it all worked out. Because contrary to assumptions, concert interpreters don’t get given a band set list. At least not until 15 minutes before showtime – at the best of times! For a band that performs 15-20 songs this means 20+ hours of study time for the interpreter – researching, learning, revising and translating lyrics. And knowing that theres no guarantee which song will be performed and possibly new ones premiered on the night, these are interpreters of a whole different league. I saw a clip of Susan performing a song by Korn and I was mesmerised by how she depicted the sounds of the instruments. The staccato. The fluidity. The overlapping tones. They were all visible. And that was when I realised that Performance Intepreters really are opening doors – not just by providing access at concerts – but by delivering artistic translations of a high standard that actually do the songs justice. I was fortunate enough to see a few other of their interpreters in action too and I can equally vouch for their artistic excellence. After seeing them I felt like saying “Yes, finally! Someone gets it!” Because they fuse the BSL content with the lyrical meaning and their body becomes a rhythmical tool. They have the ability to introduce music to those who perhaps would usually turn away from it. And that’s powerful stuff. “I would have liked to be in the crowd in standing area, and the interpreter possibly to stand by the stage as I like to see how they play their instruments. I noticed that the placement of interpreters seems to differ; on some occasions they’re on stage but more than often they’re not. Personally speaking I would like the interpreter as close to the performer as possible. 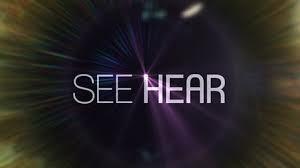 Which is why we – the deaf concert goers – need to speak up and work with the venues. 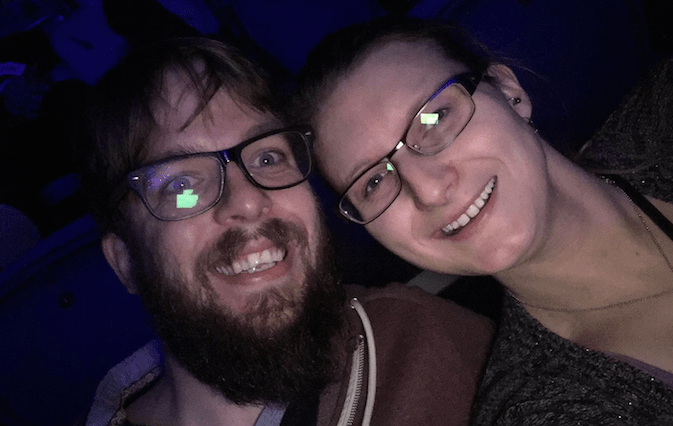 One person in particular who has worked with and for the deaf community remarkably well is Stephen Chaston – the Access Manager for Motorpoint Arena. Stephen helped Motorpoint Arena to win an Outstanding Attitudes Award and the arena has now been awarded a gold standard by Attitude is Everything who monitor accessiblity. They were recognised for their commitment to and excellent delivery of accessibly services. 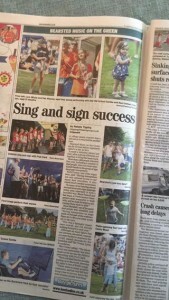 Stephen’s aim is for as many Deaf British Sign Language Users to enjoy as many events as possible. So I am optimistic that the placement of interpreters could be easily resolved if discussions begin and more feedback is received. The arena does have an access page on their website and details on their award from Attitude is Everything can be found here. 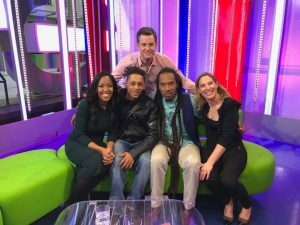 Performance Interpreters can be followed on social media and on their site to keep updated on the latest accessible shows. You can also find out about other accessible arenas near you too. But please remember that any requests for interpreters must be sent to the arena 28 days before the date of the show and if you can – please always give feedback. And if you want to attend an event but it isn’t sign language interpreted, why not drop Performance Interpreting an email and they will see if they can help. Isn’t it wonderful to see so many new doors opening? 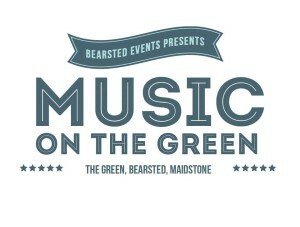 Musicals, festivals, concerts, comedy, cabaret, dance…. what’s next? And as somebody who loves to see fab-u-lous artistic deliveries of sign language, I know what I’ll be getting up to in 2017. Strictly come dancing, sign language interpreted?! Hmm I don’t mind if I do …. The Motorpoint Arena Nottingham has teamed up with Performance Interpreting to further enhance the service for Deaf British Sign Language users. The interpreting service, which includes a dedicated seating area, will be trialled at the Marvel Universe Live event on 11 September. If successful, the service will be carried out at future Arena events. Dedicated seats for Deaf British Sign Language users will be located in Block 9 (rows, A, B and C) opposite the interpreter. Please refer to the Arena floor plan on our website for further information. The Motorpoint Arena Nottingham is giving away a small number of complimentary tickets to enable the local deaf community to take part in the trial. #BSL interpretation for performances at @TheO2 is provided by @PerformInterp. We will be releasing a joint guide in the near future. Great news! The O2 has partnered with SignVideo which means #BSL users can now contact their customer service helplines live via the SignVideo link on their website! Please share the good news!